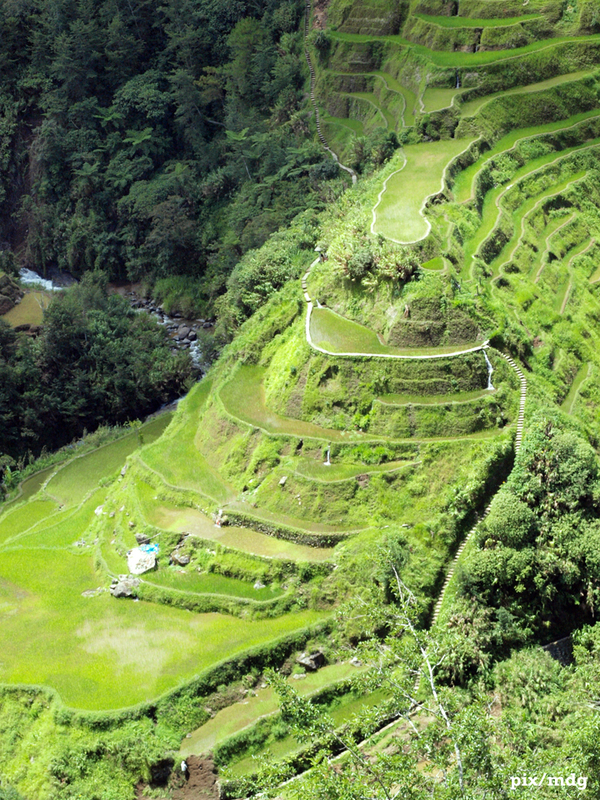 I first went to Banaue back in 2003, but that trip was more memorable because of the company than the sights because it was a very quick trip. Our main destination was another province (for work) and the trip to Banaue was just a side trip. I have more memories of the people I went with than the sights. I spent most of last week in Banaue, wherein every morning, I had the good fortune of having breakfast looking out at the famed rice terraces. I even managed going on a day trip to Sagada but that is a post for another day. 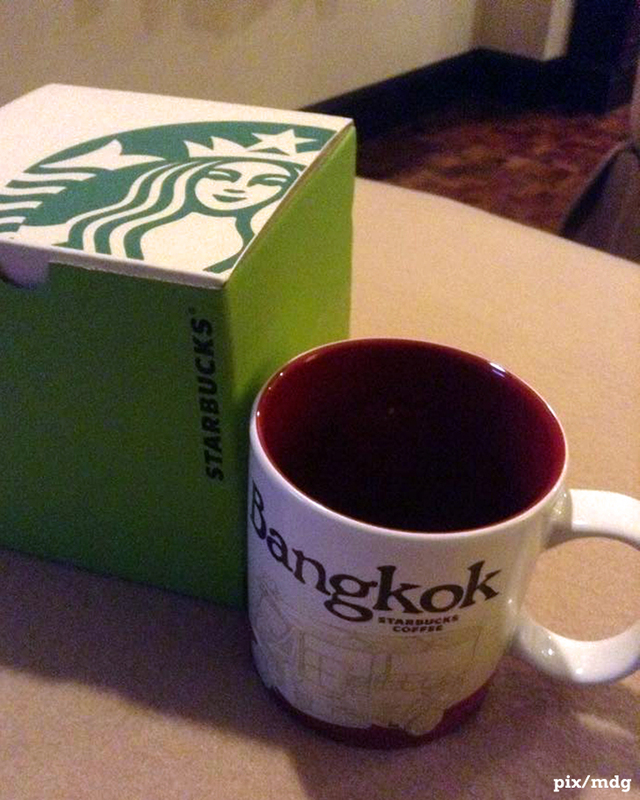 Got a Starbucks Bangkok mug last week from a friend, who I asked to buy for me. I am actually collecting Starbucks Tumblers, not mugs but I thanked her for the mug anyway. It was pretty and in its box I’m sure it took a lot of space in her luggage. If my life is turned into a line graph, one would notice that there are a few points in the line that disturbed the line in one way or another—bent it towards another direction, perhaps—divided it into two or more little lines before coalescing once again; but the line, no matter how skewed, even frayed, always goes forward. If one looks closely at these ‘points of disturbance’, there would be one that represents my participation in the 35th Dumaguete National Writer’s Workshop. I imagine it to be one big red dot, pulsing with passion and desire. In May 1996 I was a 22-year-old registered nurse who was silently resisting taking the path that lay before someone like me: find work in a clinic or a hospital for experience, take the CGFNS exams then work abroad, preferably in America. Two years before I took a position at an NGO working on HIV & AIDS prevention, which my parents approved with reservation. At 22 I have come to terms with, and have accepted, my sexuality; I was in the midst of ‘coming out’ to friends when I went to Dumaguete. More importantly, at 22 I was also reacquainting myself with the craft of writing. In spite of being an award-winning student journalist during my elementary and high school days, my writing came to a halt in college. I was happy to write the required works in 5 semesters of English but beyond that, I didn’t write anything literary. I rediscovered writing a few months after graduating, while I was reviewing for the Nursing Board Exams. In 1995 I got accepted at the UP National Writer’s Workshop. It was my first time to be in the company of aspiring and established writers, talking about nothing but writing, art, and the art of writing. I was giddy with excitement. I learned a lot from this workshop but I struggled socially. Most of the participants knew each other prior to attending the workshop while those coming from certain schools were sort of clannish. Whether intentionally or not, many of the participants made me feel like a clueless outsider. 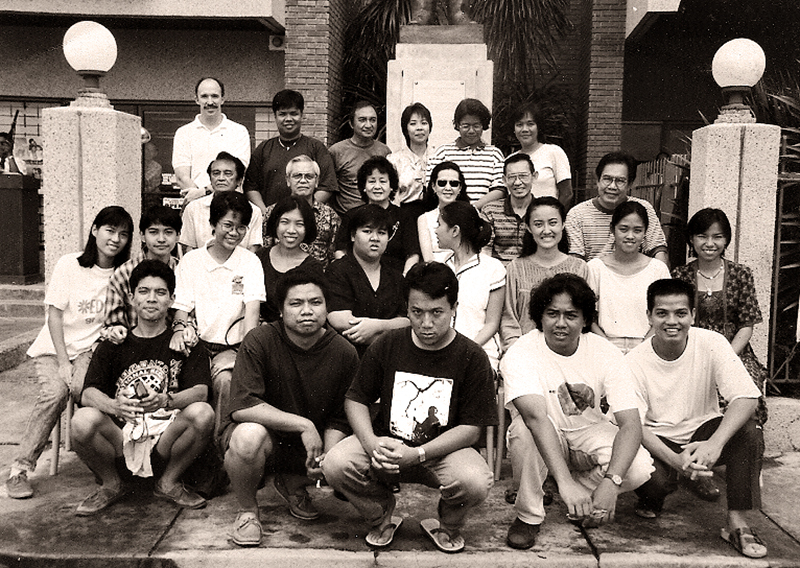 When I first saw the announcement for the 1996 Dumaguete workshop, I felt afraid. In Baguio I heard about the triumvirate of workshops aspiring writers usually go through: Baguio, Dumaguete and Iligan. My new friend from the Baguio workshop said that the Dumaguete workshop is where the real writers are picked out from the aspiring ones. He had told me the story of one participant who supposedly threw all his manuscripts overboard as he traveled back to Manila because he was told in the workshop to stick to his day-job. But I was also excited at the prospect of spending three weeks on a place I haven’t seen. In the end, I wasn’t that afraid to submit my manuscript. And I got accepted. Coming to Dumaguete, I was no longer just the ‘nurse who wrote’; I was a workshop veteran (sort of) and (technically) a published writer. Two poems I wrote about the Baguio workshop came out in Philippine Free Press while another got published in the Sunday Inquirer Magazine. But the Dumaguete workshop still blew me away. Memories of the three weeks I spent in Dumaguete will always be cherished, stored deep in my heart. Not all memories are pleasant; I shed buckets of tears when some of my works received scathing feedback from the panel and some of the co-fellows. What the workshop instilled upon me was the love of the word, which emanated from Mom Edith and Dad Ed in waves. The love for continuous learning was something that I gladly shared with my co-fellows, some of whom remain my friends to this day. Who would’ve expected socially-awkward me to make life-long friends in less than a month? but always in the right direction, okay? The Dumaguete workshop influenced my writing from then onwards. I haven’t stopped from writing, to be frank. No matter how many ‘points of disturbance’ I have encountered since, writing has become the constant thing in my life. That is why that big red dot in my lifeline keeps on throbbing with desire, with passion for the written word. Next time I see Mom Edith, I’d like to tell her that I have kept the pen going, but whether it was in the right direction or not, who knows? And who cares? Last week we cleaned out one of the sheds that my late father made and filled with his ephemera. 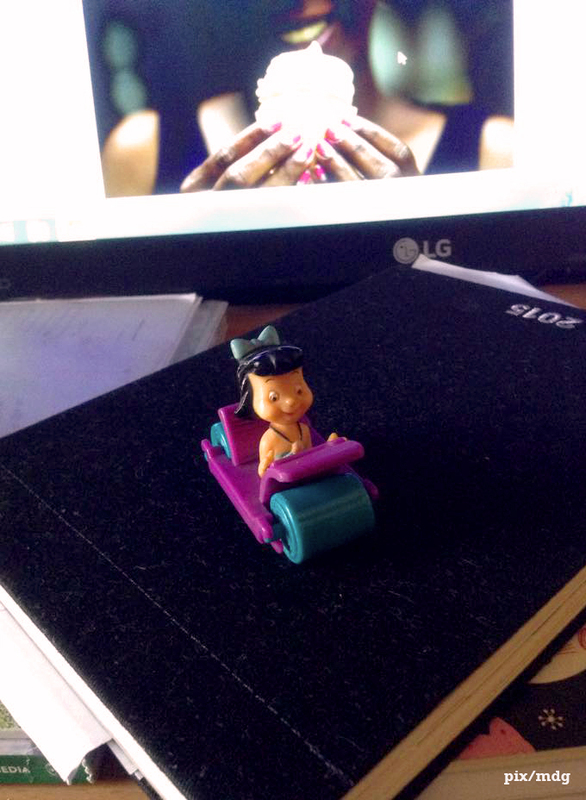 I found this little toy. It didn’t belong to me. I think it belonged to one of my younger cousins. Instead of throwing it with the rest of the things we found, I kept it. In 2009, I traveled beyond the touristy sites of the Angkor Wat complex, reaching the less-popular temples near the borders of Siem Reap and Preah Vihear. This is one of the temples, called Beng Melea, whose dimensions are exactly the same as that of Angkor Wat. 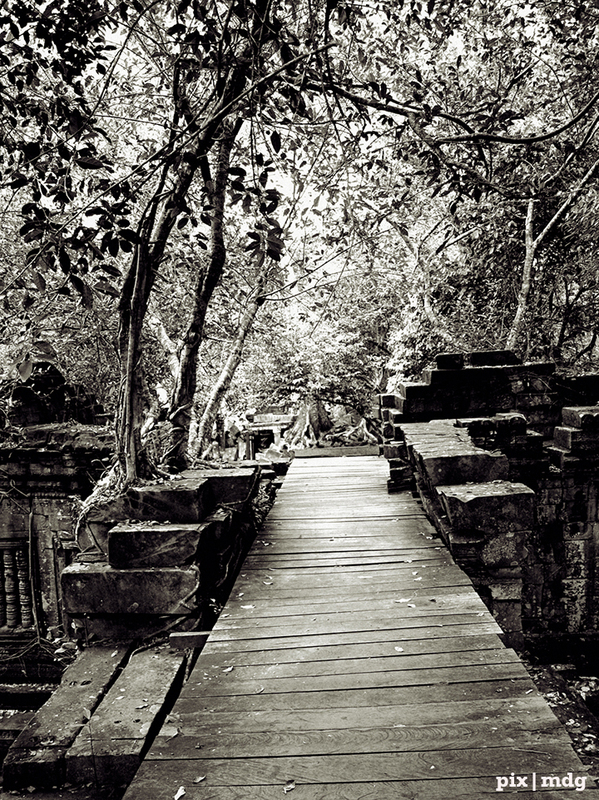 It is said that Beng Melea is kind of like the ‘sketch’ for Angkor Wat. It hasn’t been restored like Angkor Wat but the temple is majestic just the same.